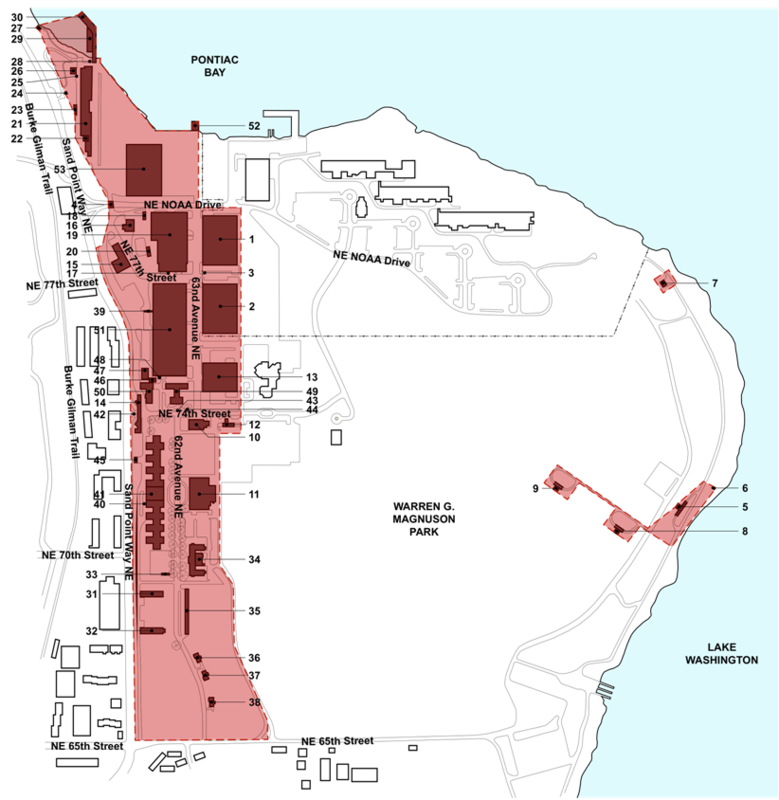 On Wednesday, March 16, 2011, the Seattle Landmarks Preservation Board voted (7-1) to designate the former Naval Air Station Seattle (at Sand Point) as a landmark district. This is the first historic district to be designated in Seattle in over 20 years. The district nomination was submitted by Friends of Naval Air Station Seattle Historic District. The formal designation marked the culmination of years of effort on the part of the “Friends” to seek protection and preservation of the cultural resources and landscape features of the historic site. The significance of the site was obvious to the Board members who also visited the site earlier this month. There was discussion at the Board meeting about whether to include five historic features located on the east end of the site. These former magazine storage structures are closely related to the use of the site but they are not physically contiguous with the western portion of the district which contains the great majority of the resources. Some board members had questions about whether it makes sense to have a discontiguous district separated by a lot of open space. They were split in their discussion but ultimately when it came time to voting for the designation, the Board members included the eastern resources and thus, the City’s first discontiguous landmark district was formed. The one dissenting vote supported the district designation but not with the eastern resources. Let’s hope this landmark district designation sparks other community and City efforts to nominate and designate more districts in Seattle! So, what’s next? I am researching the life of a dear friend who flew as US Navy Aviator from 1942-1945 first at Corpus Christi NAS, then Pensacola NAS and finally after flying 53 missions from carriers in the Pacific was transferred to Sands Point NAS. At SP NAS he would do ferry-flights of damaged aircraft to bases all over the USA. Is Sands Point the only NAS facility where he might have flown those ferry-flights? My friend made his “last flight” recently at age 97. Where are the records of the activities during those war years now stored? Frank, I only worked there is late 1983-4 as a clerk when there was a commissary there at Sand Point. I could learn more when I go to where the Naval Commissary at Sand Point was moved to at Smokey Point near Arlington, WA nearly 1 1/2 hours to the north of Sand Point. There is an office there where I could inquire. Would you like that? i AM TRYING TO RETRIEVE A PERSONNEL RECORD OF MINE WHERE i WORKED IN 1983 AT THE NAVY COMMISSARY THERE AT SANDPOINT NAVAL STATION, SEATTLE AND WONDERED IF THERE IS A PICTURE OF THE COMMISSARY BUILDING WHERE i WORKED FOR LT. McGOVERN THERE AT THAT TIME. I AM TRYING TO LOCATE A RESOURCE WHERE I WOULD BE ABLE TO OBTAIN A RECORD OF MY EMPLOYMENT THERE THEN AS A GS4 CLERK TYPIST..
Is there somewhere I can go to see what the building ID numbers are in the picture above? Click on the numbers and you’ll see a photo and info on each building.